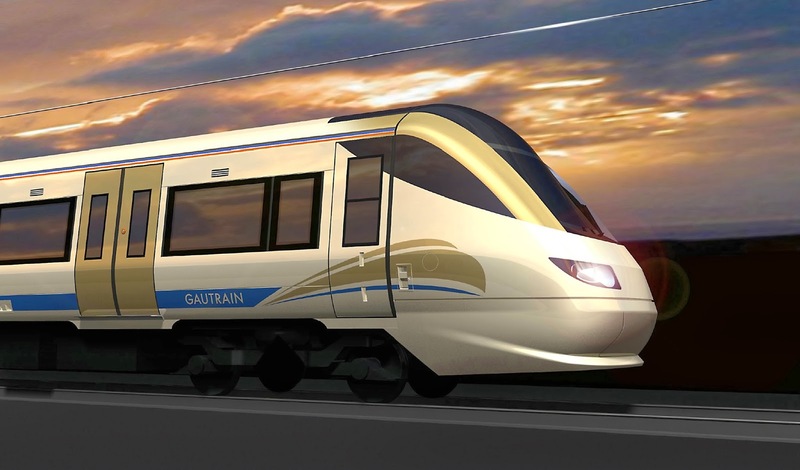 Cape Town Carbon Observatory: To take the Gautrain or not to take the Gautrain? To take the Gautrain or not to take the Gautrain? Today I found myself using public transport to get to work for the first time. Although I have a 62km road trip to get from my home in Edenvale, near OR Tambo International Airport, to the CSIR in Pretoria, it usually takes me no more than 45 minutes. This is because I travel almost the entire distance on the R21 highway, which is hardly ever slow in the direction I’m going as I’m travelling against traffic. But this week things changed. The etolling system came into effect, and the additional cost that this now adds to my journey now makes the Gautrain combined trip to work cheaper than driving my personal vehicle. Under the current petrol price, my monthly budget to get to work is about R1500. But with the addition of toll roads, which leads to an additional cost of R240, my budget now needs to be increased to R1740. With petrol prices set to increase and the deteriorating South African rand, this amount guaranteed to increase over time. If I were to take the Gautrain, and taking into account the average number of days I’m in the Pretoria office during a month, the cost for the train trip would be R1272, the cost for parking would be R180 and the cost of the bus would be R132, totaling R1584. If I take into account that I’m only going to be travelling one tenth of my normal monthly road travel by personal vehicle, it means that my petrol to get to work will be approximately R150. Which makes the total cost of my Gautrain trip R1734. So we’ve established that the Gautrain combined trip is marginally cheaper, and may be more cost effective in the future, but what about the paramount reason for using public transport – mitigation of climate change? Does this choice of transport reduce my own person carbon footprint? I was particularly concerned because when I started my last leg to work, the bus ride, there were only five people on the bus for the entire length of the journey. Is my personal footprint really going to be reduced if I’m using underutilized public transport? So I decided it was necessary to do the calculation and see for myself. To start with, what is the amount of carbon dioxide emitted if I travel in my personal vehicle to work? For one journey to work, this is a 62km road trip. Using the guidelines for mobile emissions published by Defra, a medium passenger vehicle emits approximately 186.8 g of CO2 per km traveled. Therefore, for my 62km journey, I’m looking at emitting an astronomical 11.58 kg of carbon dioxide, or 0.01158 tons of carbon dioxide. Now let’s compare that to the combined Gautrain journey to work. To start the journey from home, I have to travel 8.3km by personal vehicle to get to the Rhodesfield Gautrain station. That means I’m going to emit approximately 1.55 kg of carbon dioxide, or 0.00155 tons of carbon dioxide. The next leg of the journey is the train trip from Rhodesfield station to Hatfield station. This represents 27 minutes of travel time. The Gautrain, on a typical four car train, has twelve 200 kWatt motors. That’s a combine value of 2400 kWatts or 2.4 MWatts. Taking into account the 27 minutes, or 0.45 hours, travel time, the MWatt hours are 1.08 MWatt hours. The Gautrain is running off coal powered electricity. The EPA approximates that a coal fired power station emits 1.020129 tons of carbon dioxide per MWatt hour. This means that the total amount of carbon dioxide emitted from my train leg would be 1.101739 tons of carbon dioxide. Now that’s for the entire train. A four car train can hold 321 seated passengers and 138 standing passengers. When I got on the train this morning, it was reasonably full at about 75% seated occupation. This is approximately 241 passengers. The emissions need to be divided by the number of passengers, to get the emissions per passenger. This works out to be 0.00457 tons of carbon dioxide per passenger. The last leg of my journey is the bus trip. 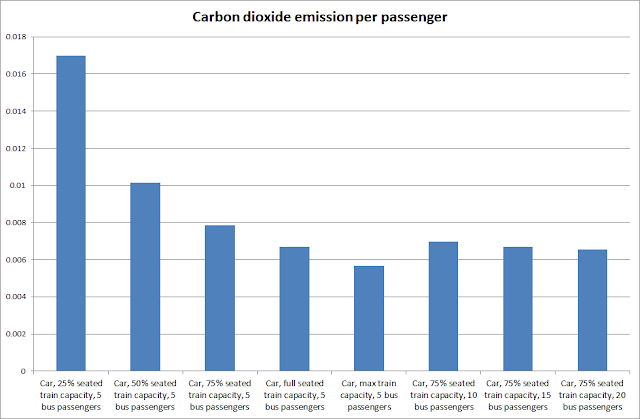 Using the same Defra guidelines, the emissions from a bus are approximately 1034.61 g of carbon dioxide per km traveled. Therefore, for my 7 km bus trip, the total emissions would have been 8.587 kg of carbon dioxide, or 0.008587 tons of carbon dioxide. Again, this has to be divided by the number of passengers using the bus. There were only five people on the bus, so the total amount of emission per passenger was 0.001717 tons of carbon dioxide. The total carbon dioxide emission for the entire journey is then 0.007844 tons of carbon dioxide. This is only 67% of the carbon emissions that I would have emitted if I had traveled by my own personal vehicle. So as far as carbon dioxide emissions go, public transport is a sure winner. The biggest draw back was the amount of time it took to get to my office, versus the normal 45 minute journey if I took my own personal vehicle. It took almost two hours for me to get to my office. The major cause of the long journey time was waiting for the next train (I managed to just miss my connecting train) and waiting for the bus to leave. This probably added at least half an hour onto my journey time. The other additional leg of my journey is the 20 minute 1.5 km walk from the bus stop to my office. Now I can probably do with the walk, but it certainly adds to the length of the journey, and doesn't do much to help my body odour during the course of the day. So to make the Gautrain journey to work feasible, I need to learn to be productive on the train and on the bus. But it's not too difficult because after all, I wrote this blog while sitting on the train. There are plenty of activities that I would normally have done at the office, which I could do during the journey, such as reading papers, writing out ideas, or checking emails. But it will require a mind set change to be really successful at this. So for the time being, while my ire about the etolls is still a strong motivation, I will continue to use the Gautrain and make a concerted effort to adapt to a new way of traveling.